In part one of No Sleep Till Richmond, you saw Brad. He busted so many tricks, I felt like you needed to see some of his best. 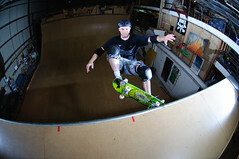 Brandon also got a sweet invert. My crappy picture of it doesn't do it justice. Next time.